The moderate rise and tragic fall of a New York fixer. Richard Gere is one of those movie stars who would probably prefer to be thought of as an 'actor', but whether he likes it or not, he's one of our great movie stars. He should take pride in such a status, as movie stars can do something mere actors can't; they can make us interested in the most thinly sketched of characters through the sheer power of that indefinable element - charisma. That's just what Gere does with the eponymous non-character of Israeli writer-director Joseph Cedar's US debut. Norman Oppenheimer is a ghost who appears out of the steam vents of downtown Manhattan. He's perpetually clad in the same outfit, yet appears to have enough of an income to move around the periphery of NYC high society. If he was played by Will Smith we'd immediately begin to suspect he might ultimately be revealed as a literal spectre. When asked to explain his career status, Norman vaguely refers to himself as a 'businessman'. He's obsessed with making connections with important people, specifically in his Jewish community, and this obsession leads him to pursue an introduction to Israeli politician Micha Eshel (Lior Ashkenazi). Imposing himself on Micha on a New York sidewalk, he later buys the politician a pair of $1200 shoes. Three years later, with Micha now Prime Minister of Israel, thanks to 'a few small favours', Norman considers the footwear purchase the greatest investment of his life. The shoes come back to haunt him however when Micha finds himself investigated for bribery as a result of accepting the gift. 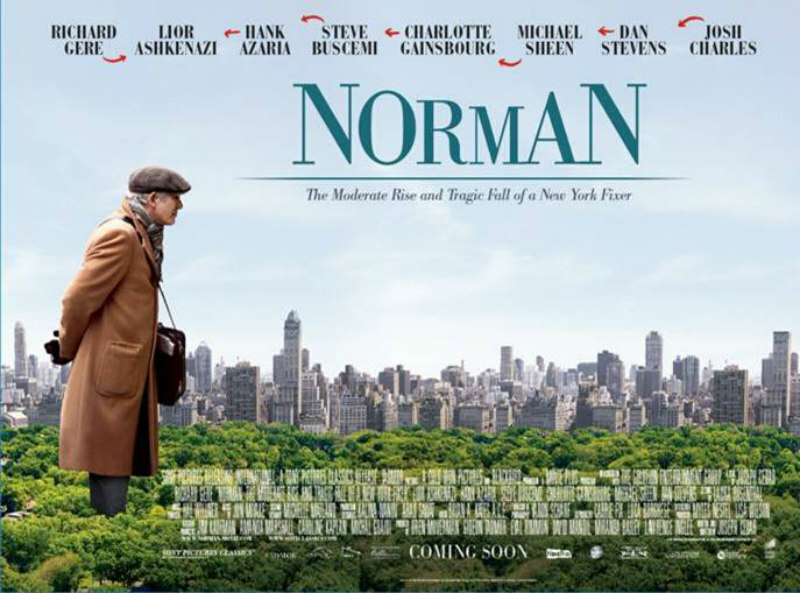 Norman is the story of an anonymous man unwittingly pulling strings in the corridors of power, but the film takes the concept of anonymity far too literally, leaving out key narrative details that lead to much frustration on the part of the viewer. Cedar chooses to deny us a glimpse of the relationship that blossomed between Norman and Micha in those three years between their initial meeting and the latter's ascent to his nation's highest office, and we only know Norman pulled some favours because a chapter card tells us so in black and white text. When the two men refer to their mutual friendship we assume it's delusion on the part of Norman and convenience on the part of Micha, but that's just a guess. They could be genuine best buds for all we know. Had I seen Norman projected on celluloid rather than from a piece of digital code, I might have begun to question if the projectionist had skipped over a reel. 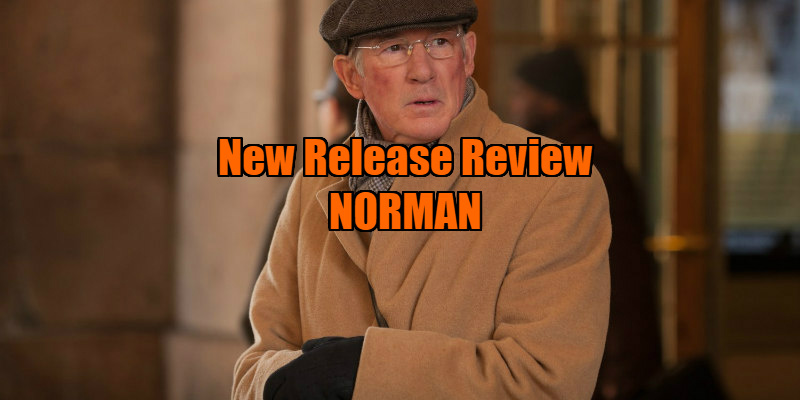 As a narrative, Norman is one of the most frustrating you'll see this year, but Gere's quietly mesmerising performance makes this a little easier to ignore. He's as good here as we've seen him for a long time, and that he manages to make a character this thinly drawn feel like a flesh and blood human is testament to his power over an audience. Thanks to Gere, we worry about Norman and sympathise with his desire to be accepted, and the contrast between his beaming smile and melancholy eyes causes us to ask questions about who this man really is, even if his creator refuses to explore such notions. Recently we saw Jessica Chastain pull off the same trick with the similarly translucent title character of another political drama, Miss Sloane. Here's to the movie stars, keeping us invested in mediocre movies since 1895. Norman is in UK/ROI cinemas June 9th.